This story is the second installment of a three-part series focusing on the challenges and solutions for affordable housing in the rural town of Boulder, Montana (read the first part of the series here). It was written by the Boulder Monitor and is published here as part of The Montana Gap project, produced in partnership with the Solutions Journalism Network. When fire destroyed two mobile homes in a Boulder trailer court and damaged two others in June 2016, it underscored what the community had known for years: affordable housing was at a premium. Calling the blocks of closely placed pre-1976 mobile homes “a ticking time bomb,” Boulder Fire Chief Shane Michael said the entire area could easily have gone up in flames, jeopardizing lives. It took five area fire departments to keep that from happening. 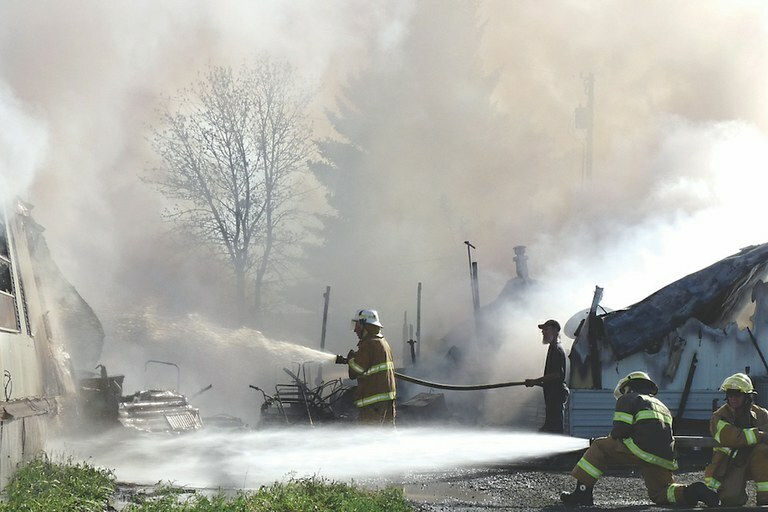 Fire fighters from five area departments work to extinguish the flames in one Boulder mobile home as smoke still rises from another one totally lost behind them. But when city officials responded with proposed regulatory changes, occupants of the trailer court showed up in droves to protest. The initial proposal called for phasing out the structures older than the 1976 HUD Code within five years and for establishing wider spacing requirements. Other mobile home occupants told the council they had no real options. They simply could not afford other available housing in town. According to “White Paper: Housing in Montana,” a 2012 publication of the Montana Department of Commerce, the average income in Jefferson County fell about $45,000-$50,000 short of the single family home median purchase price. The average elementary school teacher could not afford the median purchase price, nor could a retail salesperson, according to the report. By 2015, the statistics were even worse. Federal statistics compiled by Headwaters Economics say by 2015 more than 35 percent of homeowners in Jefferson County and more than 37 percent of renters were paying more than the 30 percent of household income for housing. In Boulder, that was after construction of a five-home affordable housing project in 2008-9 and redevelopment of 36 low-income apartments. Public comment after the fire made it clear affordable housing was still inadequate despite those projects. The city revised its regulations to bar mobile homes more than 20 years old from entering town. The adopted ordinance also increased separation between the structures. Many in town acknowledged that it was kicking the can down the road, but voiced frustration over options. “If we could go in as a city and say, ‘We’ll make it work so you don't have to lose your home,’ while still doing away with the unsafe housing, that would be best,” said Maichel, the fire chief and a city council member. Finding options for creating affordable housing is a challenge far from unique to Boulder. Two years ago, Becky Robinson, a bank teller in Ennis for nearly a decade, was living in an uninsulated pre-1976 rented trailer, unable to afford a home even though she had worked all of her adult life. “Everything was either so expensive I couldn’t afford it or so old you’d have to tear it down and start again,” she said. Headwaters Economics reports say more than 36 percent of homeowners in Ennis were spending more than 30 percent of their household income on mortgage payments in 2015. In Red Lodge, where more than 49 percent of renters were exceeding the affordable housing threshold in 2015, a trailer court filled with pre-1976 mobile homes was one alternative until development plans put its future in doubt. Nationwide, the percent of owner-occupied households paying 30 percent or more for housing went from 21 percent in 2000 to 25.9 percent in 2010, according to the Housing Coordinating Team White Paper. “Living in a rental, owning a home, living on the street or living in a shelter determines to a large extent a person’s health, sense of well-being, family security and lifelong wealth prospects. How a community houses its population is also fundamental to the character of the community, affecting crime rates, health costs, physical layout and land use, local government taxes and expenditures, and attractiveness for business and economic growth among other things,” said the 2012 White Paper. It also warned that the problem is likely to grow larger with the graying of Montana. “As Montana’s population ages, more housing units will be needed to house the same number of people as the share of one and two person households increases relative to the share of family households with children,” said the report. What are some of the solutions? Read the third part of this series here.